When putting together a condition assessment, there are two basic approaches: 1) take a random sample of your system of interest within a relevant geographic area, or 2) start with the best and worst wetlands during one year and fill in the gap during subsequent sampling years. I opted for the first approach because that’s the way the agency that funds my research rolls and I wanted as many years of data as possible on all sites. Plus, who’s got the time to organize a group of other people to decide where the best and worst places are (hint: not graduate students). 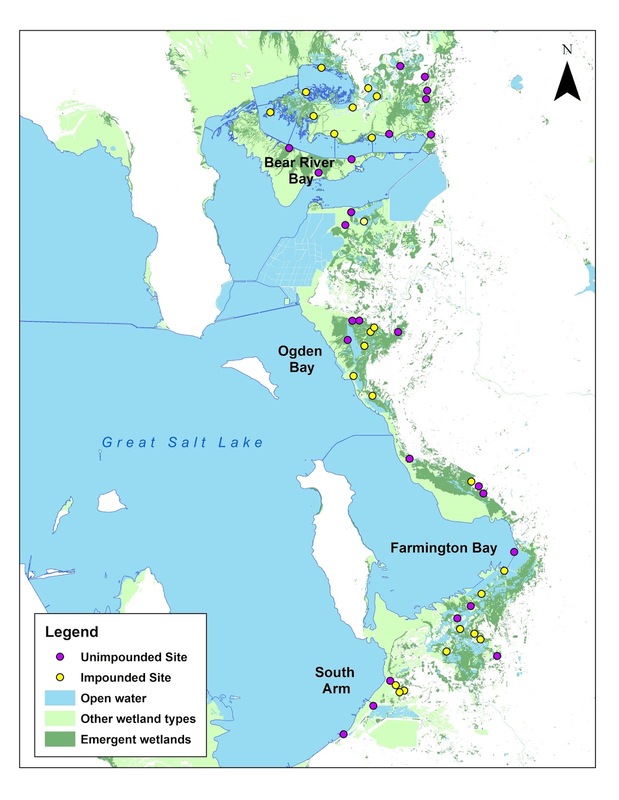 I randomly selected 50 emergent wetlands located below the high meander line of the Great Salt Lake and stratified my sample by impoundment status and region in order to capture the widest range of conditions around the Lake. My 50 emergent wetland sites. Fifty is a crazy number I chose out of the guidelines from my funders. Only one or two people actually told me that number might be a bit ambitious. The sampling strategy has hopefully provided a lot of high quality data (and adequate degrees of freedom), but there were some other, more practical implications of my random sample. Randomly selected sites might be right next to a road or two miles away. I’ve developed really strong hip flexors slogging over 290 miles of walking to and from my wetlands over the last four summers (a conservative estimate that doesn’t count in-site travel or time spent lost). Random samples have no sense of land ownership, so I also got to go on many, many miles of awesome boat rides! Out on my favorite marsh. It's a beautiful wetland and I get to take a boat there. And the hunting guide that helps me is great. Or they might say, “Do whatever you’d like,” and I’d find myself panicking underneath a canopy of 20-foot tall Phragmites. The Phrag is really scary, perhaps the place I've felt the most un-safe in my whole life. Including un-impounded wetlands in my sample meant that I got to hike out to places the wetland managers had never been because there’s not much management to be done in places with no water control. This is exciting. Wandering out into the unknown has been the most logistically challenging part of my work, but also the most rewarding. It’s been really fun to share what I’ve found with the people that manage my wetlands (and validating when they say, “Oh my gosh, you walked all the way out there?” Yes, yes I did. It was hard.). Out in these unknown places I’ve found the coolest plant species and the strangest hydrology. Sesuvium verucosum - one of my absolute favorites. Seasonal water levels in a bunch of un-impounded wetlands - so cool! But really, the best part has been gathering my collection of flotsam decoys. 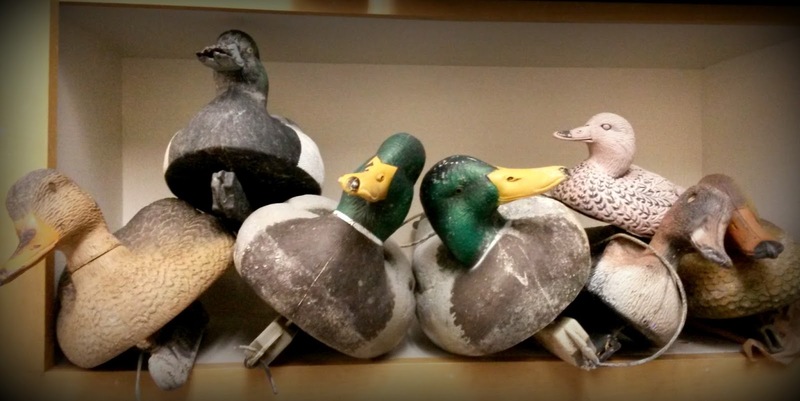 Long ago, these decoys broke loose of their anchors and floated into the emergent vegetation, where they remained hidden until a random sample required this crazy grad student to wander out there. It’s just like discovering buried treasure, because they were once worth money and they’re usually buried in the vegetation to some degree. 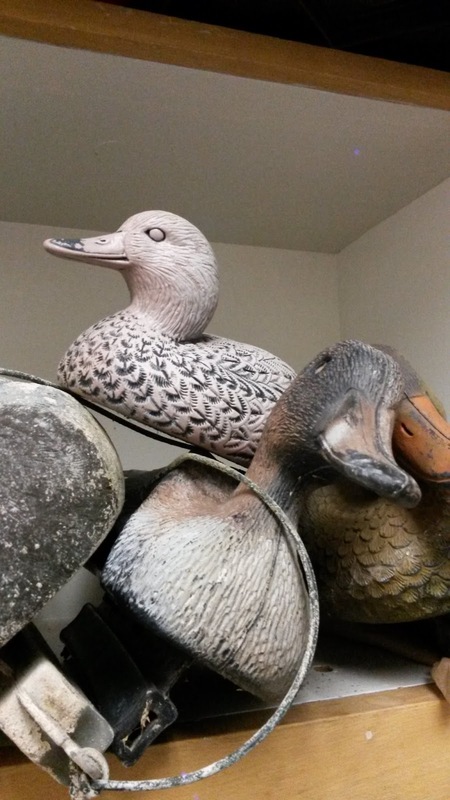 The decoys have been in the marsh long enough to become waterlogged and most have lost their eyes and a lot of their paint. 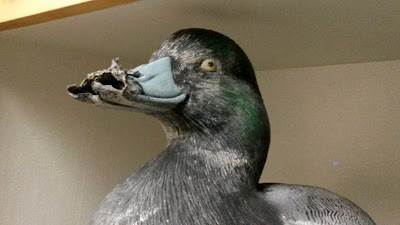 Those decoys that found their way into the Phragmites fared the best, as they were well protected from the elements. 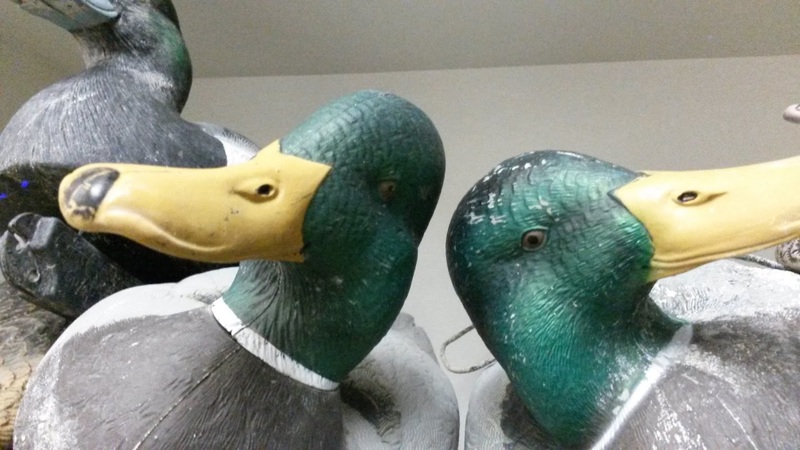 I discovered almost all of my decoys in places where hunting is not allowed, so there’s an illicit feel to the whole thing. I’m done with field work now, so I think my collection is complete. I’ve placed them all - the mallards, teal, and blue-bill - on a shelf where they can cheer me on as I write. Random sampling is awesome!